Gods & Heroes Relocated To Mt Victoria By The UN! A large angry man, clad only in a toga, was seen hurling thunderbolts at other similarly-clad beings atop the Mt Victoria Lookout last weekend. When stunned Kiwis, visiting one of their more beloved sites around town, asked one of the women what was going on she replied “Zeus is having a hissy fit. Again”. Another large man, clad in a massive lion’s hide, was seen wrestling animatedly with what he claimed was a 9-headed Hydra. It was, in fact, a stuffed kiwi plushie from Kirkcaldie & Stains. 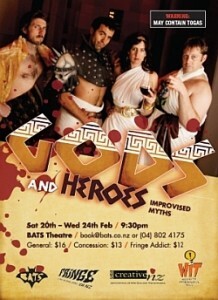 Gods & Heroes: Improvised Myths is a brand-new improvised show, featuring Wellington Improvisation Troupe’s (WIT) most experienced players. The Greek Gods and Heroes you know and love now have a new home, atop Wellington’s own Mt Victoria. Witness the creation of new myths and legends as the daily squabbles and dramas of the Gods and Heroes invariably spill over into the world of the Kiwi mortals. “Our Gods and Heroes are just like humans – they have the same strengths, the same weaknesses. They bicker and fight just like any family. They reflect our own stories, which is great material for improv”, says Christine Brooks, Director for the show. “WIT has built a reputation for character-based improvised theatre that focuses on storytelling, through three seasons of its sold-out improvised soap opera, The Young and the Witless, and Gods and Heroes will build on this,” she said. WIT’s best character improvisers bring you Gods & Heroes: Improvised Myths from Saturday February 20 to Wednesday February 24 at 9:30 p.m. at BATS Theatre as part of Fringe 2010. WIT is an improvised theatre group that has been performing shows in the Wellington region since 2003. WIT has over 30 active members and they are also producing two other shows for Fringe 2010: The Improvathon and the popular format, Micetro. This entry was posted in Other formats, past shows on February 5, 2010 by MaDmin.